For most people, eating begins with seeing - usually with the first step into a restaurant. 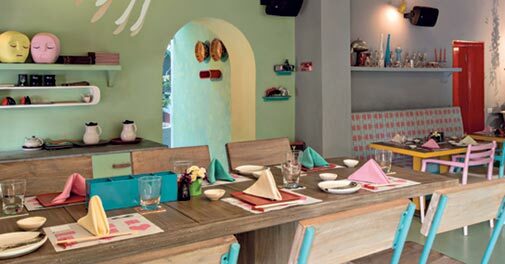 At Guppy by ai, designer Anshu Arora gives you the experience of a wonderland - with lion fish lights, Japanese kokeshi dolls and many a Japanese antique wonder drenched in pop shades of green and pink. Even before you take a seat, you're sold on the restaurant. Start your meal with the guppy house salad, which bustles up your taste buds with delectable flavours of bamboo shoot, karashi mustard and crunchy vegetables and gives you a sneak peek into the Japanese culinary extravaganza you're going to explore. The tenderloin tataki in soy dressing is another masterstroke from Chef Vikram Khatri's kitchen that will floor you with its unique flavour and melt-in-the-mouth meat. The light mushroom gyoza, kept light through its bottom steamed preparation, does wonders for your palate. However, the prawn version of the dish - which comes across as a little overcooked - isn't really appetising. 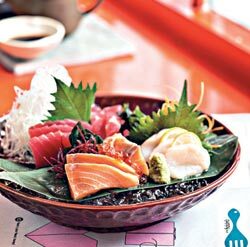 Since nothing spells Japanese better than the classic sushi, Guppy by ai gives you an entire list of sushi and sashimi to choose from. While I would wholeheartedly recommend the salmon and tuna sashimi, the one must-try dish on the menu is the restaurant's signature pork belly. Glazed with soy honey and served with mustard miso sauce on the side, this is single-handedly the best reason you should head to the place. The pork is soft, soaked in flavour, and among the best you'll ever have. The chashu ramen or homemade egg noodles is also an option worth exploring. Round off your meal with either carrot cake or lemon cheesecake; you don't have much of a choice, given the restaurant's limited dessert menu. But, to answer the big question, is Guppy by ai worth a visit? I'd say it's worth a lot more!